In March of 1999, MuseumShop.com and Antenna Audio formed a new strategic partnership. The objective was to leverage the product awareness of bricks and mortar museum shops throughout the world into an innovative partnership between museums, the leading museum e-retailer, and the leading audio tour provider. On its first year anniversary together, the site has experienced dramatic growth and achieved recognition by Gomez.com as a leading online gift-shopping site. This paper examines the successes and failures of the initiative and its impact on museums using the Web. How has the consumer market and museum industry responded? How has the financial and interactive community responded? The paper describes what synergies emerged from the partnership and how interactive and public media is used to maximize museums' e-commerce initiatives. The authors will describe the overall state of museum e-commerce in North America and Europe, what products have been successful, which museums have benefited and for what reasons. At the inaugural Museums and the Web Conference in 1997, museum leaders expressed concern that online exhibitions would deter visitors from their physical museums. Three years later museums accept the fact that their online exhibitions attract new visitors from all corners of the world and help to build global recognition of their physical exhibitions. Today, museum leaders are now concerned that they are missing out on the Internet commerce goldrush. The museum world has historically experienced a strained relationship between exhibition and merchandising initiatives and the Internet can exaggerate this rift. Museum stores managers are notorious for being considered as the stepchild of museum staff and are still viewed by curators and educators as "money changers on the steps of the temple of knowledge". Even purist museum visitors often sniff at the "inevitable" retail stores positioned at "blockbuster show�� exits and the proliferation of Mondrian ties and baseballs signed by Cezanne. The Internet can be used as a tool to quell the conflict between curators� drive to educate and museum retailers� drive to grow revenues by turning merchandising into educational outreach. Markets and commerce are a vital part of public life. At their best, museum stores can serve as extensions of exhibition spaces, whose educational and artistic inspiration can directly influence purchases. Like museums, shops are public forums where people mingle to exchange ideas and compare esthetic (albeit often materialistic) values. Consumers� desire to buy goods and services can provide a gateway to the core mission of the parent institution, beyond the simple purchase of an exhibition catalogue. Back in the 1970's and 80's, the Museum of Modern Art in New York spread its "brand" around the country by distributing it's products in upscale gift shops nationwide. And newer museums, like MOMA in San Francisco, have placed their commercial side on the street level and facade of the institution, so that shoppers and cafe dwellers can slip right through the merchandising interface into the core of the museum. The goods and services museums provide are more than simple revenue generators. In their best form, the products are commercial ambassadors that project the museum�s trademark into the outside world, promoting the institution and suggesting the virtues of a visit. In their worst form, "museum-like" products without genuine connection to museums� exhibits risk exploiting museums pristine image and actually turn-off to visitors; possibly the greatest fear of museums. For this reason museums are very careful about the products they develop and the commercial partnerships they form. Museum�s commercial activities are eternally bound by the educational mission and the purist aesthetics of each institution and it's target audience. The Metropolitan Museum of Art would not allow a Burger King franchise in its cafe, yet across Central Park, kids and adults delight in consuming "Dino Fries" at the American Museum of Natural History. At the same time, the AMNH will not sell a Buzz Lightyear doll in its Rose Space Center. To help mediate this balancing act, museums can form strategic partnerships with firms that have experience straddling the for-profit and non-profit world and that understand the sensitivities required to successfully market educational products and information. The most successful partnerships shield museums from the financial risk and capital investment necessary to develop large commercial activities, while carefully leveraging the museums� products and services through collaborative initiatives. 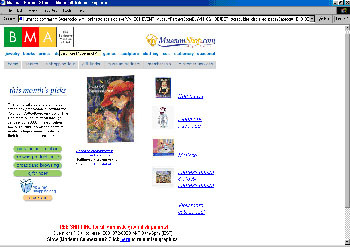 One example of a new form of strategic partnership was launched by Antenna Audio and MuseumShop.com in 1999. Antenna Audio is a fifteen year veteran of museum services, providing audio tours for most of the world's major museums, including, the Vatican the Louvre, The Metropolitan Museum of Art, Museum of Fine Arts, Boston and the J. Paul Getty Museum of Art. MuseumShop.com is a two and a half year old "dot com start-up", and already is the largest provider of online stores for museums, linking together the products of over forty North American and the major European museums. The goal of this alliance was both to combine the international sales force and museum network of Antenna with the Internet and E-commerce expertise of MuseumShop.com, and to partner with museums globally. The partnership was based on an understanding that there would be restrictions on the products sold; only those products developed or distributed by partner museums were to be displayed and sold on the MuseumShop.com Web site. Similarly, all of Antenna's audio tours are produced in direct collaboration with client museums� educational and curatorial departments. Although the joint venture is only nine months old (an eternity in the Internet world), it is clear that this product and content exclusivity is key to its success. The Internet projects museums into a vastly larger potential audience than ever before, and the partnerships developed in cyberspace are critical to assuring museum buy-in. Museums reactions have been favorable to a Web site that combines and leverages the product and content that has already been developed by fellow museums in a complementary manner. Consumer reaction has also been favorable to the display of thousands of products and content from a consortium of museums and products that have never before seen together; and in ways that are not possible in click and mortar stores. This is a prime example of how the Internet now is forcing museums to think in new entrepreneurial ways about promotion and the relationship between and the collection and the commercial products. The MuseumShop.com Web site provides consumers with a gateway to museums in new and powerful way. 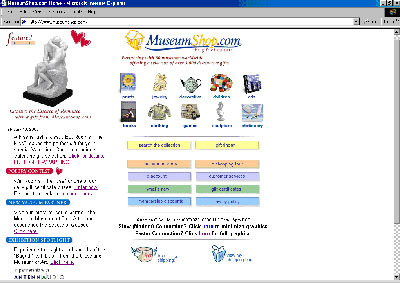 Every partner museum on MuseumShop.com benefits from a custom home page or "Microsite" that provides information and links to the museum�s primary Web site. For those museums that are interested, Antenna and MuseumShop.com display audio-visual highlights of representative works from each museum's permanent collection. When visitors click on representative images, the screen fills up and plays the associated descriptive audio message. The visitor hears selected educational audio clips about the images that are identical to the ones they would hear if they visited the museum in person. Antenna and MuseumShop.com also produce exhibition spotlights for museums� temporary exhibitions. 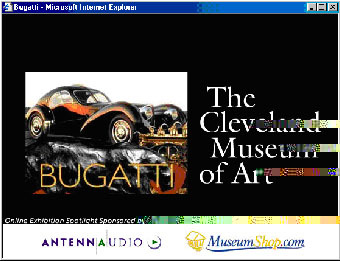 These mini-Web experiences display sound and images often with introductions by the museum Director or exhibition curator, along with information pages describing the exhibition, links to ticketing, and selected thumbnail images, again expandable by clicking through to bring up the image and hear the audio stop. The net result is a simple-to-use online multimedia experience that allows Web shoppers from around the world to sample and consider a visit to the host museum. The exhibition spotlight repurposes content, already developed and funded by the audio tour programs, into an effective format that attracts visitors to the site and informs them about the parent institution. The audiovisual productions currently require a Flash 4 plugin and offer a link to download; today Flash 4 is bundled on most 4.0 and higher browsers. The content programming for each of the sites is financed by Antenna and MSC.com and is provided free of charge to partner museums for use on their site. 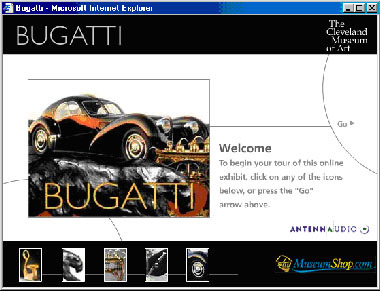 The first online spotlight was designed for the Bugatti exhibition at The Cleveland Museum of Art. Even though the exhibit closed in October, the exhibition spotlight has been popular and Cleveland�s product sales were among the highest on the site during the Christmas season. 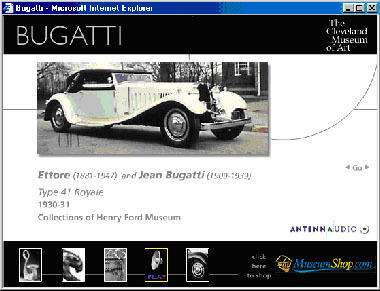 Antenna and MuseumShop.com are now producing exhibition spotlights and features for the Faces of Impressionism: Portraits from American Collections exhibition and its permanent collection, as well as the permanent collection of The Minneapolis Institute of Arts, the Whitney Museum of Art and several major European Museums (to be publicly announced in March of 2000). The new form of audiovisual merchandising and cobranding on MuseumShop.com duplicates in the virtual world in way that is similar to the proliferation of physical satellite stores within and outside of museums. Yet it is important to emphasize that the transition of physical retail stores onto the Internet is not seamless and requires very different skill sets. The media frenzy over the success of the Internet and the speed of its growth and metamorphasis has left many museums convinced that they are missing out on a huge opportunity but baffled as to how to develop an Internet strategy that does not compromise their mission. In their effort to quickly establish an Internet strategy, most museums underestimate the true capital and human resources required to build, manage, and market a sophisticated online store. Few museums understand the extremely high expectations of online customers (most expect next day delivery of orders and 7 out of 10 customers will contact the museum via phone or e-mail to inquire about their order) . Few museums understand the complexity and cost of providing superior shipping and customer service logistics on a large scale. And even fewer museums understand or can respond to the flexibility of business models required to survive in the Internet world. The entrepreneurial structure of MuseumShop.com allows it to assess and adjust its business model according to the changing Internet tide. The objective is to build a site that will allow armchair travelers to sample and shop from museums around the world. In the highwire world of the Internet, after only two years, MuseumShop.com is already a veteran. In the early fall of 1999 it closed its first round of venture financing that enabled them to proactively address several areas. One example of this was managing e-commerce shipping logistics. Initially, all MuseumShop.com products were "dropped-shipped" to customers directly by each museum partner. As the volume of orders increased exponentially and as customers increased their orders from multiple museums, customers began to experience high shipping costs and inconsistent fulfillment across museums. Since many museum partners did not have permanent staff to handle Web shipping initiatives, the museums had a challenging time keeping up with the inevitable holiday shipping influx. To address this, MuseumShop.com decided to manage its own warehouse and fulfillment center. Now museum partners� products are shipped directly to the Ohio warehouse, which enables MuseumShop.com to guarantee to customers same day shipping of orders received by 2pm (EST) and next business day shipping of orders received after 2pm (EST). This makes e-customers happy. In order to defray the costs of bringing on new museums, MuseumShop.com initially charged an annual set-up/networking fee that was prohibitive for some museums. This fee is now waived for all museums with over 750,000 visitors annually, and reduced for all other museums. All museums are eligible for exhibition previews and benefit from MuseumShop.com�s public relations and marketing initiatives. All museum partners benefit from MuseumShop.com�s active marketing and positioning on the major shopping portals including Yahoo! and Excite as well as through affiliate marketing programs powered by LinkShare and other online bots. Additionally, partners benefit from public relations and promotional initiatives. The process of becoming a partner museum is simple. MuseumShop.com either purchases products from the museum partner at wholesale or consigns products from the museum partner giving the museum partner a commission when the product sells. Most museums opt to sign up for the wholesale relationship as it is no different from setting up a bricks and mortar outlet. MuseumShop.com handles all aspects of the production of the partner�s Microsite, all secure credit card transactions, customer service via e-mail and phone support, and all refunds and credits. This relationship makes it very easy for museums to participate and join the ranks of the growing collaborative including 40+ museums across the world. < http://www.archimuse.com/mw99/papers/bowen/bowen.html > which measured visitors to museums� Web sites and discovered that the vast majority of visitors to museum Web sites seek museum collection and exhibition, and schedule information, while only a fraction of a percent of visitors click on the museum�s store (The percentage of those that purchased products was not measured). Visitors to a museum�s Web site may take a path from a Monet exhibit to a Monet scarf, but very rarely start at the scarf itself. MuseumShop.com�s objective is to attract the visitor who is seeking a scarf to the Monet exhibition that inspired the scarf�s design on its partner museum�s Web site; and simultaneously to sell the Monet scarf. MuseumShop.com targets its marketing initiatives to online shoppers seeking gifts with cultural significance. Antenna Audio�s experience in the early days of audio tours is telling. Many of the major museums initially spent significant resources attempting to set up their own audio tour divisions. But the distractions and complications of not being thoroughly in the audio tour business caused all of these ventures to eventually die. Like the audio tour business, e-commerce is difficult and expensive to manage on a large and sustainable scale. Millions of Web sites compete for visitor's attention with the largest 10 sites comprising over 50% of Web traffic. Single destination sites will have an extremely difficult time attracting visitors and customers. Those e-commerce sites that survive will amalgamate a critical mass of affiliated sites in order to defray the exorbitant cost of financing the ever-changing technology, promotion, advertising, and logistics needed to be successful. Museums will end up collaborating with entities and outsourcing much of their e-commerce activities. New competitors to the museum Web industry proliferate daily. There is a new outpouring of Web sites claiming to be the next museum "portal" including museum.com; destinationblvd.com; museumnetwork.com, and wwar.com, and even bricks and mortar retailers like The Museum Company. Many of these sites have links to individual museum�s Web store pages. All that is required to create links to museum Web sites and store fronts is basic html skills. Providing a single point of ordering, customer service, and logistics for a consortium of museums is far more complex. There are also a preponderance of art and poster sites that are wooing museum merchandisers including art.com, barewalls.com, posters.com, and ImageExchange.com; each with a different approach. Finally, it has now become inexpensive for anyone to develop a store on Yahoo! and benefit from the high volumes of traffic and reporting tools; but in order to effectively sell products online, museums still need to invest in Web designers and staff to continually update the site, manage inventory, handle secure credit card transactions, provide real time customer service, and ship individual products to each customer. The far greater challenge is developing large scale museum partnerships that effectively merchandise through educational outreach. The Antenna/MuseumShop.com/museum partnership is a unique business model that promotes the products of museums retail, curatorial, and educational departments in a new collaborative model. This model builds on the collective brands of all the participating museums while providing new visitors and sales. This collaborative e-commerce model is generating encouraging results that should provide valuable lessons for museums that seek to expand their audience and revenue-generating opportunities on the Web.